I well remember the Golden Age of high-end audio, when you just put your equipment on a shelf, plugged it into the wall, and listened. How different those times were, especially considering the price and design of the Stillpoints ESS 28-40-3 rack which costs $10,275 USD. My path to isolating audio equipment from resonances has been long but rewarding. I began with an equipment rack made of cinderblocks and 1"x6" wood planks; later, I had handmade plywood cabinets. My first true efforts at isolation began with 0.5"-tall aluminum Tiptoes from Steve McCormack, of Mod Squad fame -- I bought many of those cheap little cones and placed them under my equipment. I then went on to soft feet and cones, hard feet, discs of jade ore, feet of solid carbon, hardened balls sitting in depressions, bladders, springs, multi-layered shelves, shelves of heated and compressed Styrofoam, shelves of thick glass, wooden racks, steel racks filled with lead shot, and various damping weights. Most of these made a difference; whether the difference was good or bad was another story. Ultimately, I settled on Mana stands as the best isolation system I had experienced, though I experimented with other shelves even in the Manas. Later, Acapella Fondao Silenzio platforms on the Mana glass shelves, using the pucks that came with them as feet under the components, proved better still. For a while, I was happy with this combination. But while I thought my adventures in isolation had all been part of my own rational process of getting the best sound, I cant guarantee that the results would have satisfied anyone else. Although Id improved everything to some degree, I was to discover that I was still far short of true isolation from vibration. In the 1990s, I saw a picture of a Halcyonics Model One active isolation platform at a New York City high-end audio show, where it had been demonstrated isolating a glass of water. The Model One had resisted all efforts -- pounding on the table, shaking the table, etc. -- to cause a ripple in the water in the glass. I contacted Halcyonics US importer and asked if the Model One was good for isolating components from acoustic feedback. He said not only did it do that, it also absorbed internal vibrations generated by the component sitting on it. He asked if Id like to listen to one. Of course I did. I received a Model One, loved it, and ultimately bought two more. Theyre expensive -- some models cost over $10,000 each -- and very effective. For a long time, I hoped that this German-made product would get cheaper, which would allow me to have Model Ones supporting everything in my system, but alas, the euro kept getting stronger against the dollar, and I had to "get by" with just three. Enter the Equipment Suspension System (ESS) from Stillpoints, makers of the famous support cones. I first saw and heard the ESS racks at the 2008 Rocky Mountain Audio Fest. The system in the room in which they were being used sounded great, but of course it was impossible to tell which component was most responsible for the sound. However, John Tucker of Exemplar, whose top tube preamp was being demonstrated in that room, told me that the ESS rack was quite good. Later, after hed bought one for himself, he was more emphatic. As I greatly respect Tuckers work and hearing, I asked for an ESS for review, but demand for the rack meant that my review sample wasnt shipped for several months. Finally, after the 2009 RMAF, it arrived. 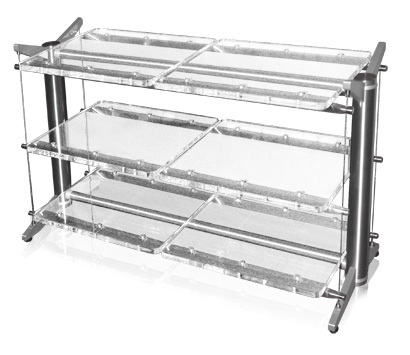 The reader can see from the photograph that the ESS 28-40-3 is a striking-looking rack of stainless steel and acrylic. Hidden somewhere in all this, included under each shelf, is the Stillpoints technology first used in the Stillpoints cones. Id had experience of acrylic shelves in the past, and I had misgivings -- but if the acrylic shelves were detracting from the sound of this rack, I didnt hear it. The Stillpoints consists of an outer case, two layers of ceramic balls, and a stainless steel pedestal. The Riser is an aluminum base with a stainless steel stud, which accepts the Stillpoints. The system functions as a shock absorber for vibrations and resonances. The system changes vertical vibration into horizontal motion and absorbs it. Following the path of vibration from the top of the exposed ceramic ball (at 12 oclock), as the component is placed on the Stillpoints, the vibration exits that ball at the contact point of the second tier of balls at a diagonal (4 or 7 oclock). The weight of the component expands the second tier of balls, forcing them into the surrounding petals, which flex and absorb the vibration. From the platform or shelf, vibration enters the bottom outer rim of the Riser, travels to the center of the Riser, and transverses up the stud into the center of the pedestal. Finally, vibrations travel across the pedestal to the outer edge into the ball/petal mechanism and are absorbed. The system utilizes constrained-layer damping techniques by assembling ceramic, Delrin, stainless steel, and aluminum materials. The system also provides for the leveling of components via the threaded Riser and studs. It took me about two hours to assemble my 40"-high ESS 28-40-3 rack with its three 20"W x 16"D x 0.75"-thick shelves. The fit and finish of this product is exemplary, and it definitely looks high-tech. Though others may not, I love its appearance. It took me another three hours to disassemble my system and reassemble it on the ESS. Although Id listened to the system prior to disassembly, the comparison with the new rack was a long-term one. I was also mindful that the components, having been turned fully off and their cables substantially twisted, might take some time to recover. This would, of course, disadvantage my first impressions of the Stillpoints rack. Other than now sitting on a new rack, my system was otherwise unchanged. However, only one of my Halcyonics -- the one under my Exemplar DAC and SACD player -- was displaced. Each of these was placed on the Stillpoints rack, as were my H-Cat line stage and phono stage and the Exemplar Music Server. My Shindo Labs turntable and H-Cat amp remained on their Halcyonics Model Ones. I used in my evaluation This Is K2 HD Sound (CD, First Impression Music FIMK2HD078), just as I had at the 2010 Consumer Electronics Show and T.H.E. Show and RMAF. I played a rip of this sampler from the hard drive of my Exemplar Music Server. Track 1, Symphonic Dances, was quite a shock. This is a big orchestra playing big climaxes. Although I was listening at my usual volume level, it sounded a good deal louder, with an authority, foundation, and clarity that hadnt been there before. Notes had sharper leading edges than before. When a new instrument entered, I was startled, as I imagine I would have been at a live concert, had I not noticed that musician getting ready to play. Another word for this is realism. I dont think that many of us -- perhaps none -- know what our systems might sound like if all vibration were to be eliminated. Listening now, I had the distinct impression that all smear and lack of dynamics, perhaps caused by vibrations, were suddenly gone. It sounded to me as if I was now hearing what my system sounded like when much more of the airborne, structure-borne, and internal vibrations generated within the components themselves were being damped or removed. And, of course, that may well have been exactly what was happening. Id had the same initial impressions with the Halcyonics Model Ones, but their efficacy depends on how fast their electronics can counter the vibrations they encounter. Nor do I know whether the Stillpoints technology performs throughout the audioband. I do know that I turned the volume up to the level I hear when seated at the center of row two, leaned back, and thoroughly enjoyed the performance. Track 2 on This Is K2 HD Sound is a flamenco performance, "Zapateado," and it confirmed my initial impressions. The footfalls of the dancer were realistically portrayed and precisely located. Im growing tired of this selection, but that doesnt make it any easier for a stereo system to capture, and the ESS rack dramatically improved its sound. Tracks 5 and 16 are also growing old, but the decay of the bells and the gongs shimmer and decay on "Touch," and the background sounds in Pachelbels Canon in D, were just more realistic, and the leading edges of percussion sounds were startling. The last track of Frank Sinatras Only the Lonely (CD, Capitol/Mobile Fidelity Sound Lab/Koch B001BJ65SU) is his melancholy take on "One for My Baby." The intimate feeling of this recording was correctly lost with the Stillpoints rack -- I was immediately aware that the recording studio was quite large and not intimate at all. Sinatras performance of this song on Sinatra at the Sands (CD, Reprise 46947-2), while still in a large room, had a much more intimate feel. Willie Nelson and Wynton Marsaliss recent album, Two Men with the Blues (CD, Blue Note 04454 2), is a live recording of some pretty funky music, such as "Aint Nobodys Business" and "My Buckets Got a Hole in It." The sense of the recording venue with the Stillpoints was quite real. Without the ESS stand, I got some sense that there was an audience present, but not a sense that I was part of it. The Stillpoints changed that. The instruments also had a realism and leading edges that Id never quite heard before. The piano and drums also had greater authority. Finally, I played some LPs on my Shindo Labs turntable. The sound was authoritative, especially the bass. Duke Ellington and Ray Browns This Ones for Blanton (2 45rpm LPs, Fantasy OJC/Analogue Productions 2310-721) was striking in its clarity. The piano is the key here, and its honky-tonk sound came through with great realism. Both Browns bass and Ellingtons piano were very accurately reproduced, transcending anything Id heard before from my system. I ended up listening to all four sides of this recording. Another recording that I often use is Belafonte Returns to Carnegie Hall (RCA/Classic LSQ-6007-2). While the performance is quite good, it is the sound of the audience, as well as the ambient sounds around and beneath Carnegie Hall, that lend realism to this recording: You can distinctly hear the subway approach, stop, and depart, and the movements of the performers onstage give you the impression of being there. The applause after each song was strikingly real with the ESS 28-40-3, and the other sounds were never clearer. The Stillpoints ESS 28-40-3 is, of course, a device for reducing or removing from the reproduction of music the interference of vibrations. It doesnt have the "sound" of rubber or most woods, nor of steel or brass points. Ive never heard a music system in which every component sat on a Halcyonics base, but the sound of my system with everything supported by the ESS 28-40-3, including the amp and turntable, was much better than the same system sitting on three Halcyonics and my Mana stands. Everything in my system has been chosen because it contributed to the reproduction of a realistic soundstage and the timbral accuracy of instruments, and I had long assumed that I was enjoying all that the electronics and speakers could give me in terms of that realism. The Stillpoints ESS 28-40-3 rack showed this assumption to be baseless. From the sweetness of the highs to the solid bass, everything had a rightness to it. I suspected from the first listening session with my components on the Stillpoints rack that it was something special. You cant see it working, but you sure can hear it.